I realize that I have been away from the blog for quite some time. Thank you for all of the messages I have received checking in to make sure that I'm ok and asking for updates. I do intend to keep this blog up and running, but it may be another month or so before I get back into the swing of things. 1. I got a job! Well, two actually. At the beginning of February I was hired by my favorite LYS, The Yarnery, and I jumped at that opportunity. Any store that acts as a flagship for BrooklynTweed, is the exclusive Twin Cities carrier of Neighborhood Fiber Company and has an intimate relationship with Shibui is where I want to be. In January I had been lamenting to a friend about how difficult it is to find a job in music and she suggested that you just have to think outside the box and try to combine your passions. How does one combine knitting and music? I'm still not sure, but the day after I started working at The Yarnery, I got a call from the temp. agency I was working with and they told me about a job working for the Minnesota Orchestra. As some of you may know, the MO recently overcame a 16 month lockout due to a dispute between the management and the musicians over a proposed salary reduction. It was great news when the orchestra finally reached an agreement, but it also meant that the ticketing and sales department had three weeks to process nearly 2,500 subscription orders before the orchestra began playing again at the end of February. Once that period ended, the orchestra very graciously offered to hire me on as an employee so I could continue working for them. So I'm not sure how to combine both my passions other than to simply get jobs in both fields, but that works for me! 2. I still knit all day every day. In fact, now I can even knit at work without being reprimanded. At the yarn shop knitting sort of comes with the territory, and at the orchestra I spend all day answering calls on the ticketing line, so between calls if there isn't any other work to be done, I knit a few rows. 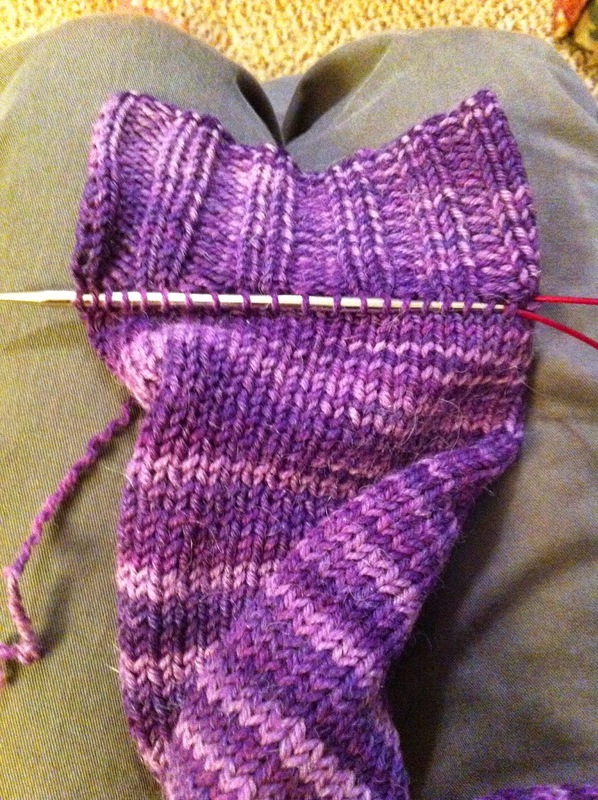 It comes in especially handy because most of the knitting I do these days is sample knitting for designers. I was watching a video a few weeks ago (Orenburg Knitting with Galina Khmeleva, I'm a sucker for instructional videos) and she was talking about the women of Orenburg knitting for survival. It's a story we hear quite often about the past. People in Orenburg, Estonia, Shetland, knitting so they can put food on the table and then I realized... that's exactly what I'm doing. It sounds excessive to say that I'm knitting for survival, but when it comes right down to it, I do in one way or another depend on knitting to supplement my income. People at work sometimes say how wonderful it must be to have the free time to get so much knitting done, but I don't consider it "free time." Most days I work back-to-back shifts at the orchestra and then the yarn shop, and then I go home and knit for 4 hours because I have deadlines to meet. I do enjoy it for the most part, but that doesn't mean it's not work. It may not be a scheduled shift in an office, but it's not really a leisure activity either. 3. 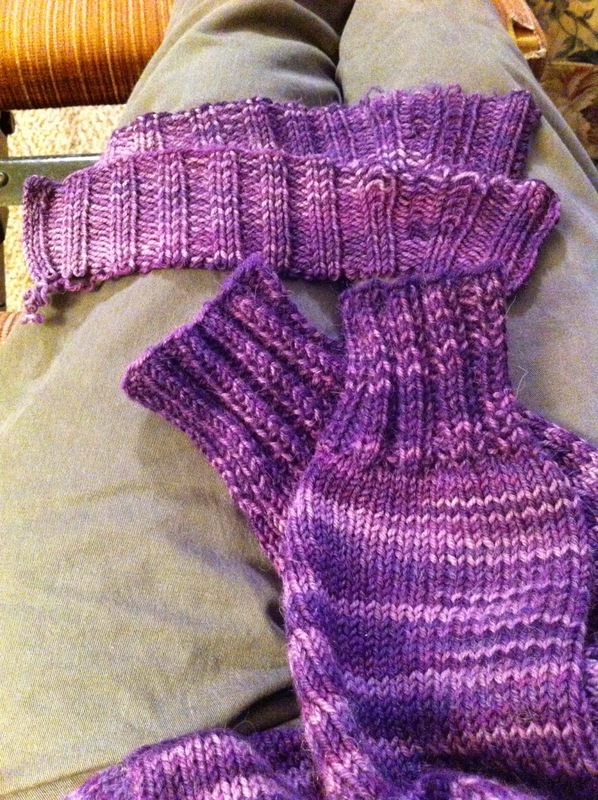 I do still knit for fun, too, don't worry. It just has to happen slowly in between projects, like if I send out a sweater and the yarn for the next one hasn't arrived yet (like right now) or if my "for pay" project is too big to take on the go, I may work on a sock at work instead. Like I said, I'm knitting all the time. 4. 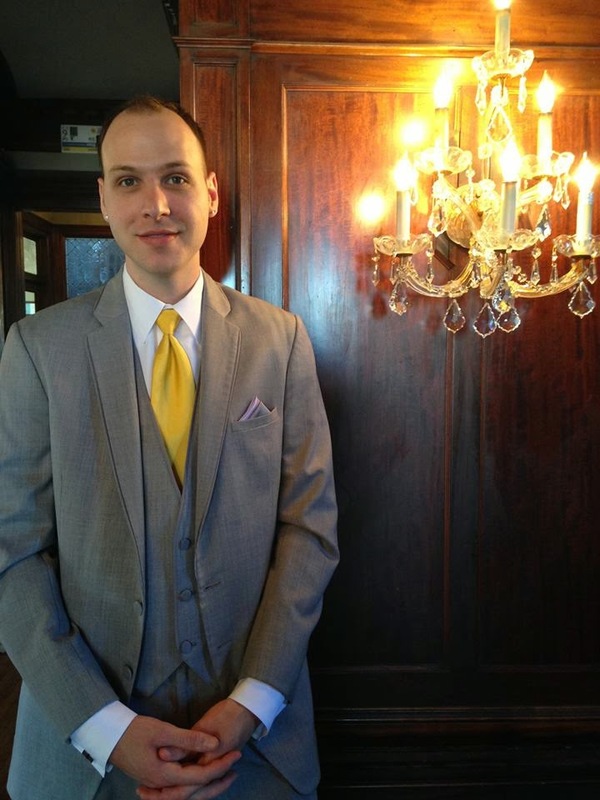 My brother got married last weekend and it was a ton of fun, despite the fact that I cried every two minutes. I was one of his groomsmen. The reason I'm even bringing this up is because my brother is a dancer and as a surprise for his husband, he choreographed a dance to a Beyonce mashup for the reception and it was amazing and I think you should all watch the video. I'm not actually sure if it's on YouTube, but maybe you can watch it on Facebook by clicking on this link. Let me know if it works? 5. There are probably 17 other things I should be telling you, but it's almost 1am and I need to get to bed. Quickly though, the sweater surgery. The other day, my brother who just got married said to me, "Peter, the sweater D (our sister) made for me has a dropped stitch on the cuff and it's unraveling. How do I fix it?" 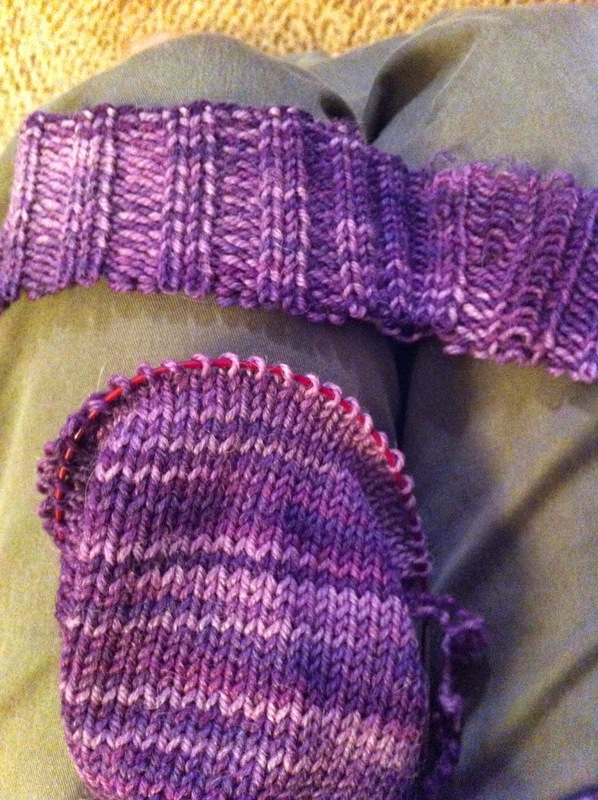 Well, it turns out that it wasn't really just a dropped stitch, but both cuffs were completely falling apart. I'm not surprised. My brother doesn't go anywhere without this sweater. I don't know how he can wear it, I have two sweaters in Ultra Alpaca and even in the dead of winter I get heat stroke within minutes of putting them on. But he doesn't seem to have that problem. Anyway, when he showed me the sweater and asked, "How do I fix it?" I told him, "You don't. I do." So I took it home with me. The yarn is now discontinued (Ultra Alpaca Tonal), but I managed to find some for sale online. 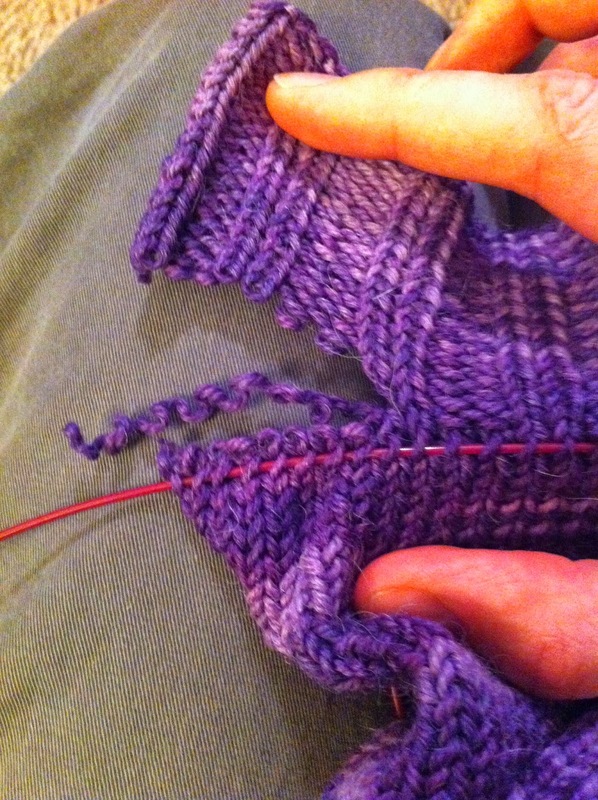 The sweater was knit flat from the cuff up, so I undid the seam a few inches past the cuff and picked up stitch in the row below (above?) the cuff so I could knit a new one on. 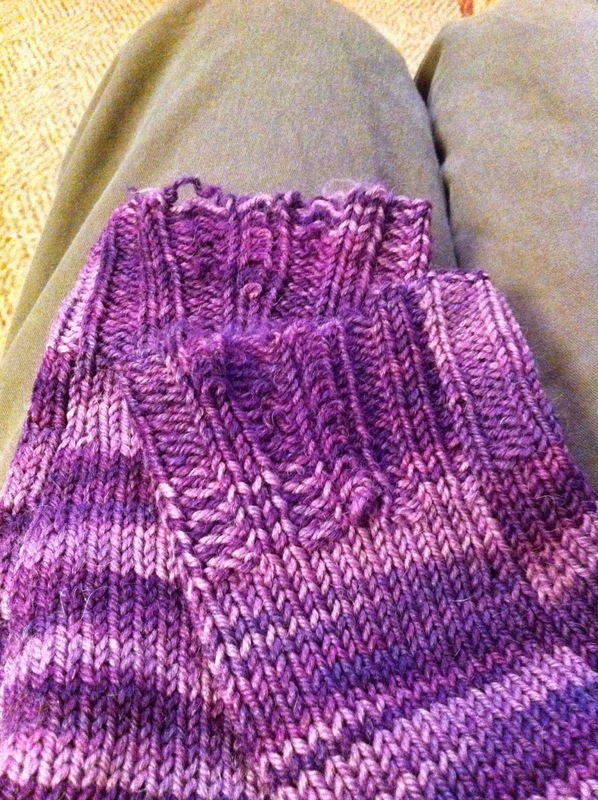 Then I snipped the cuff a row or two above my needle and unpicked that row of knitting. Speaking of discontinued yarn, I'm looking for an extra skein of Cascade Soft Spun color 2803 (charcoal gray) to finish a sweater I should have finished last July. You don't happen to have any in your stash, do you? And with that I'm going to bed. Have a good night, y'all! As always, it's great to have you drop in to give us an update. You look great all duded up for the wedding. The video worked and it was hilarious. It's good to hear you're working and that the two things you love are able to help you put food one the table. Very nice seeing you back, Peter! Congratulations on your new jobs. You looked so great for your brother's wedding and I loved the video. What an excellent dancer!!! Congrats on BOTH of your new endeavors! It sounds like you are making your niche work and really... you can't beat that! Congrats on the jobs! My cousin chatted with you at The Yarnery, so I knew you were working there. (fiber folks are a small community!) The new cuffs look great on the sweater. I hope you can get some time off to go to Shepherd's Harvest this weekend. I'll be in Bldg D this year. Stop and say hi! Congrats on your jobs!! Sounds like a couple of pretty great gigs. Yay jobs! Whew, though, that's a lot of work. Your brother's video was adorable.